NEWMARKET, Ont. - A sentencing hearing is scheduled today for a drunk driver who caused a horrific crash that killed three children and their grandfather. 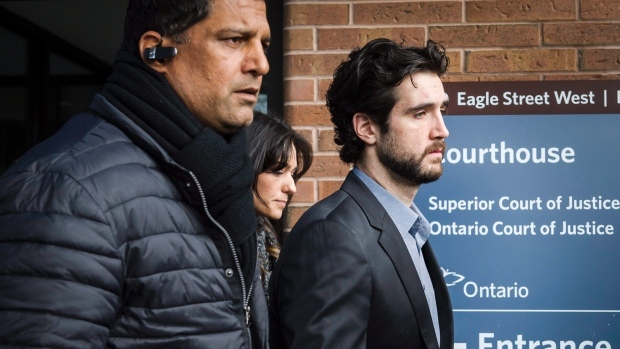 Marco Muzzo, 29, pleaded guilty earlier this month to four counts of impaired driving causing death and two of impaired driving causing bodily harm and was released on bail until today's hearing. A Newmarket, Ont., court heard he was so drunk at the time of the Sept. 27 crash that he urinated on himself and needed help standing. Muzzo had initially faced a dozen counts of impaired driving and six more charges of dangerous operation of a motor vehicle. Nine-year-old Daniel Neville-Lake, his five-year-old brother Harrison, their two-year-old sister Milly, and the children's 65-year-old grandfather, Gary Neville, died after the van they were in was T-boned by an SUV in Vaughan, Ont. The judge is expected to hear statements from the Neville-Lake family and Muzzo over the course of the hearing, which could stretch over several days.